So how do we identify these customers? Of course, we can write a very long and complex formula to get the list. I think we are better off using that energy to reach out to these customers and improve the sales. So lets figure out an easy solution. 4. Our report for non performing customers in 2002 is ready! You are right. Although this approach gives answer for a particular year, when we want results for another year, we need to repeat all steps again. Not cool man, not cool. we could set up a report filter on year and see which customers did not have any sales for any given year. Alas, lets assume Moosa is stuck with this data. We could improve our original solution so that user can select any year (or all) and see which customers did not fetch any sales by using a simple helper column. Just go to the original data set and add an extra column at the end. Now, we want to fetch only the selYear’s data in to this helper column. So if 2002 is selected, we want data in C4, for 2003 data in D4… and for all we want sum of all numbers in C4:M4. Looks like we can use some INDEX magic here. Now, our helper column fetches any one years data or sum of all years data, based on what users want. Awesome! Armed with our helper column, lets re-create the pivot table. But this time, instead of dropping any one year, we will drop selected year column in to “Values” area. This way, our pivot report shows customer names for selected year. Lets add a combo-box form control so that we can select the year interactively. Our pivot report does not refresh whenever we select another year. Of course, we can easily fix this with a one line macro & some duct tape. Click here to download example workbook & see this in action. Explore the macro & pivot table settings to understand how this works. I think this is a perfect example when Pivot table based solution is simpler compared to formula based one. Not only is it simple to set up, but it is very usable & modifiable. Often we complicate a problem by trying to figure out the perfect formula for it. I think an intelligent Excel user needs to mix various options – pivot tables, vba, formulas, tables etc. to get the solution in few simple steps. This way, we can spend rest of our time finding out why Foger Rederer never bought anything from us after 2005. What do you think? 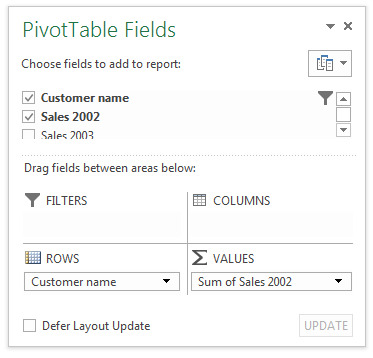 Do you use pivot tables often? How would you have solved Moosa’s problem? Please share using comments. Consider joining in our Excel School program: If you want to learn how to combine formulas, pivots, conditional formatting, charts & various other features of Excel to do awesome stuff, then please consider joining my Excel School program. It is a completely online course designed to make you awesome in Excel and Dashboards. To know more and join us, please click here. 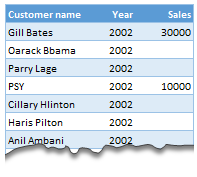 To avoid the helper column and the macro, I would transpose the data into the format shown above (Name, Year, Sales). Now I can show more than one year, I can summarize - I can do many more things with it. ASAP Utilities (http://www.asap-utilities.com) has a new experimental feature that can easily transpose the table into the correct format. Much easier in my opinion. Of course with alternative data structure, we can easily setup a slicer based solution so that everything works like clockwork with even less work. David, I was just about to post the same! In Contextures site, I remember there's a post on how to do that. Clearly, the way data is layed out on the very beginning is critical to get the best results, and even you may thinkg the original layout is the best way, it is clearly not. And that kind of mistakes are the ones I love ! because it teaches and trains you to avoid them, and how to think on the data structure the next time. Eventually, you get to that place when you "see" the structure on the moment the client tells you the request, and then, you realized you had an ephiphany, that glorious moment when data is no longer a mistery to you!!! This formula will sum the sales from Selected Year to 2012. If you are already using a helper column and the combox box runs a macro after it changes, why not just adjust the macro and filter the source data? And yes, since I'm matching off of them for value, I would change the headers to straight "2002" instead of "Sales 2002" but you sort the table on the helper column and then and there you can answer all of your questions. Hi thanks for this. Just can't figure out how you get the combo box to control the pivot table. Can you please advise? @Kevin.. You are welcome. To insert a combo box, go to Developer ribbon > Insert > form controls > combo box. Thanks Chandoo. But I know how to insert a combobox, I was more referring to how does in control the year in the pivot table? Or is this obvious? I note that if I select the Selected Year from the PivotTable Field List it says "the field has no itens" whereas this would normally allow you to change the year?? Still not sure why PivotTable Field List says “the field has no itens"?? I created my own pivot table and could not repeat that. will provide the last year in which that particular customer had any sales, which can than easily be managed by autofilter.